The uprising was about 600 days old when two pilots under my command became invaluable. It wasn’t because of their ability or a lack of funds, as there was enough blood money to hire a dozen mercenaries that would become killers in any of my giant walking robots. Rather, the two pilots, Glitch and Behemoth, had been there from the start. They’d fought the same battles and lost the same allies, and letting them die on a windswept desert planet was inexcusable. So the mission that put them in danger required better tactics. The idea of preserving their lives was silly in the beginning; they were merely expendable avatars. 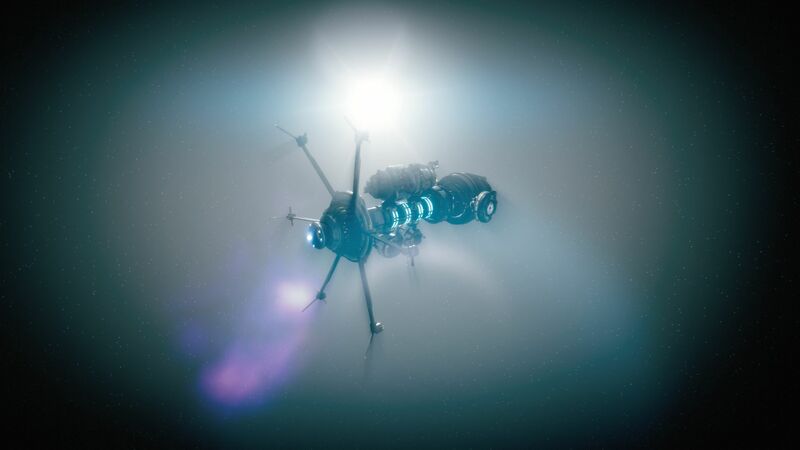 At some point during the interstellar rebellion, I had become a mercenary commander with a conscience and would do all in my power to save both pilot and machine. Glitch and Behemoth survived the war; it lasted 1224 days. 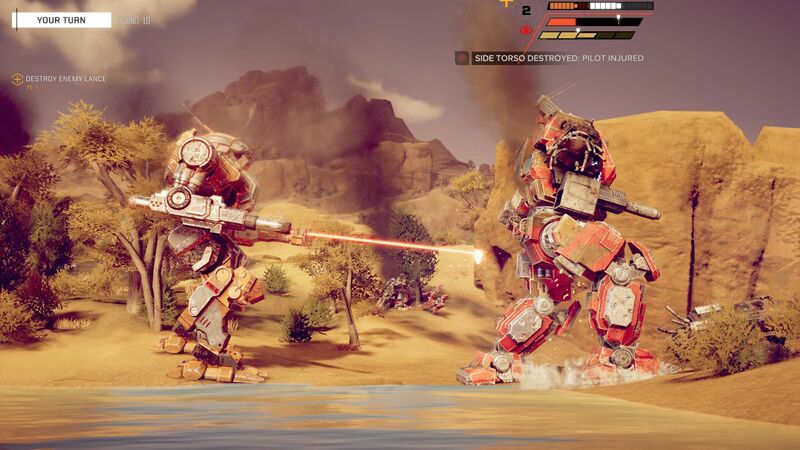 BattleTech is the work of developers Harebrained Schemes and it exists in the universe of the same name that was originally created by Jordan Weisman in the 1980s. This futuristic setting already brought us several video games, including the MechWarrior series. 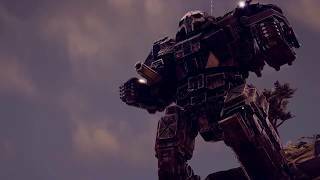 In BattleTech, you view the action from above and command four hulking machines across different biomes one turn at a time. There's more involved than that, of course, including repairing BattleMechs, hiring pilots, and managing the books between missions, but the crux is about showing 'em whose giant robot has the biggest swagger. 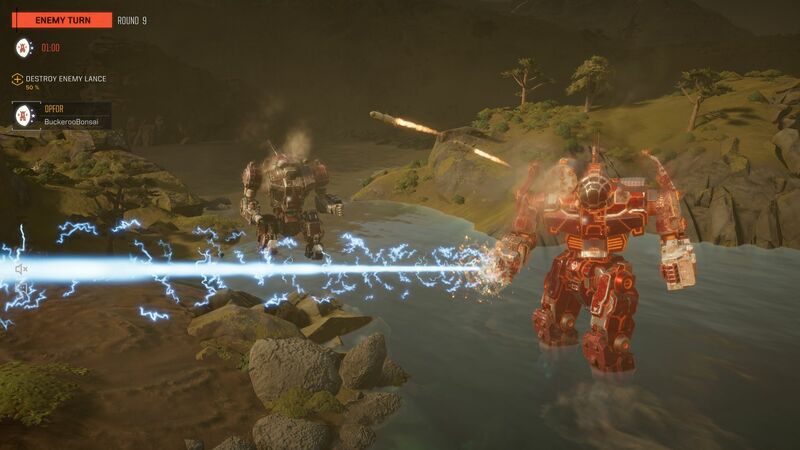 Like many turn-based games, BattleTech is a slow burn. It is tactically intriguing with management aspects that make it worth experiencing, even if it stumbles with variety and the delivery of its own story. Although it mostly consists of generic skirmishes across non-descript battlefields, there is an overarching story about restoring royalty to their rightful throne. It starts at the end, with a character named Kamea Arano informing the player that they are a hero and have saved an empire. This unconventional opening makes for a weak start. There is a power struggle while you are escorting Arano and she is assumed dead. You are rescued by mercenaries and three years later you become their leader for unclear reasons. From here, you'll need to maintain a healthy bottom line by completing side contracts until the story wakes from its slumber. The story sleeps for too long. It takes 30 hours before the narrative even has an arc with the usual suspects of betrayal, deception, and sacrifice. Priority missions only become available after an indeterminate number of side contracts, so it might be hours between the dribs of story content. There is enough carrot at the end of the stick, but it's held so far away from the player that they can barely see it. The presentation of the story is also inconsistent. Like StarCraft 2, characters aboard the mercenary spaceship are fully three-dimensional but they only have a short animation loop and it makes them appear robotic. Text dialogues will occasionally pop up, requiring player action; deciding what happens to the last pot of coffee—for morale purposes—is not a bad thing, but these events are boring and start to repeat. There are some nice hand-drawn cut scenes between missions, but characters and events can look different in them. It's a game that never quite knows how it wants to present itself and opts for a little of everything. It's fortunate that when BattleTech throws its weight around, it's not via the narrative. All the heavy-hitting is done via tactics; not just in the skirmishes, but in the management of pilots, repairs, ship upgrades, retrofits, and contracts. As the commander of the renegade robot brigade, you decide what contracts to accept and can negotiate the appropriate recompense for risking life and chassis. Making a deal is as simple as dragging sliders and taking money or salvage (parts and weapons). You can forgo rewards and earn reputation, although new players will ignore this due to the already paltry rewards, monthly upkeep, and costly repair bills. The choice of generic contracts can be broken down into a few types: battles, escorts, assassinations, and more. Just pick a contract, select four 'Mechs with pilots, and then drop to site. While there are side objectives, the basic goal never veers far away from killing enemies. The difficulty of contracts is irregular, but it is based roughly on total tonnage. Players will steadily acquire a roster of 'Mechs from light, to medium, to heavy, to assault. Once you go big, you'll never go back, unless you need a nimble spotter to skirt opponents. After grinding contracts for hours, the game will open up a story mission. These still revolve around killing although have more colorful objectives. You'll have to liberate a prison, capture explosive ammo caches, and destroy a DropShip. In the early parts of the game, story missions are longer and harder than contracts, because of turn limits and the number of enemies. Many of these priority missions had eight enemy 'Mechs, several turrets, and a few annoying tanks, all attacking at once. Waiting an eternity for units to finish moving and hoping that none of them did too much damage was common. Generally these hand-crafted missions are easier when using specific tactics, like positioning correctly or attacking multiple targets at once. When it comes to the tactics on the battlefield, there is enormous depth. The combat is turn-based and quite slow, as units take a while to move and shimmy and fire. Each unit can move a set distance on a point grid across the terrain, depending on their agility. Sprinting increases movement range at the expense of not being able to fire weapons. In an effort to encourage sprinting and jump jets, units will receive an evasive bonus the further they move from their current position. Positioning determines which part of a 'Mech will be hit by fire. Energy weapons need direct line of sight but missiles can work over hills (and sometimes through rocks). Attacking from the rear exposes weaker armor, and critical hits might disable weapons or injure pilots. Destroying an arm can reduce the unit's offensive power and damaging a leg might see it topple or become unstable. Melee attacks are fantastic, although it's possible to 'miss' from close range. Various pilot skills can increase hit chance or remove evasive bonuses—targeting individual limbs requires morale, which comes back to managing things outside of combat as well as succeeding in the field. In any case, cause enough damage in the right places and the targeted unit will explode in glorious fashion. Additional strategy is required to navigate the battlefields. Rough terrain impacts stability, cliffs prevent ascent, radiation fields impair target acquisition, and trees provide cover. The various biomes also affect the amount of heat dissipated; Moon locations make heatsinks ineffective and frozen planets allow for more laser beams than a 1980s disco. All the different landscapes help to change encounters in interesting ways. There are enough tactical elements to provide many possible options per turn, and no two battles are the same. The AI is competent and aggressive towards injured or exposed units. They also act erratically and make deadly mistakes that should be exploited. 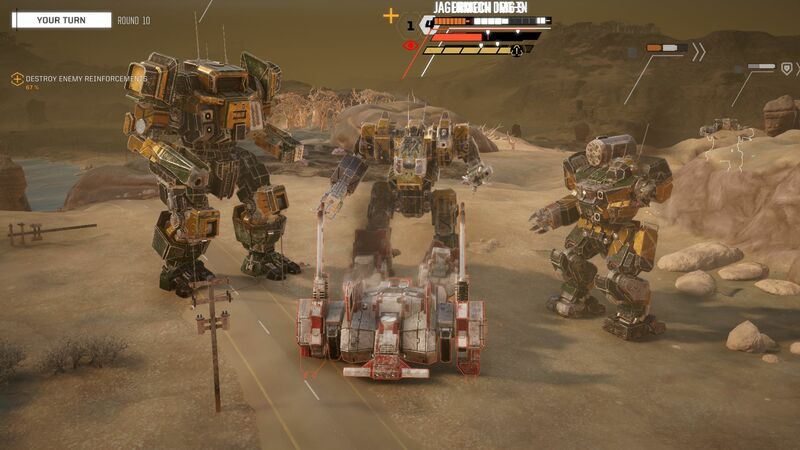 Although there is some luck involved, most notably with the AI landing head shots, the skilled tactician with the best 'Mech line-up will win the day and salvage their just rewards. After combat, there is the opportunity to readjust loadouts. 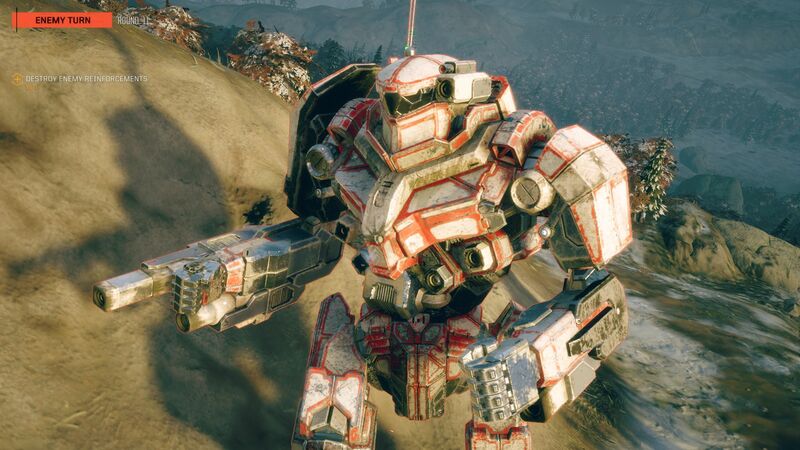 Add more armor if a 'Mech is suffering too much damage or remove jump jets if you'd rather allocate the tonnage to raw firepower. It's possible to strip all weapons and start from scratch, crafting the perfect setup for a certain style of play. As you progress, rare weapons bonuses will compel even more adjustments. Every time a limb gets blown off, it's an opportunity to adjust. This tinkering behind the scenes is satisfying when it eventually results in a dominating combination. Between combat encounters, the campaign revolves around the concept of time progression. Time advancement is needed to repair 'Mechs, heal pilots, travel between systems, or upgrade ship components. Repairs can take days, refits can take weeks, and healing can take months. Days will pass in a few seconds but cannot be skipped or sped up. Because of this, travelling between systems, for new contracts, might be a good idea if you have to wait anyway. 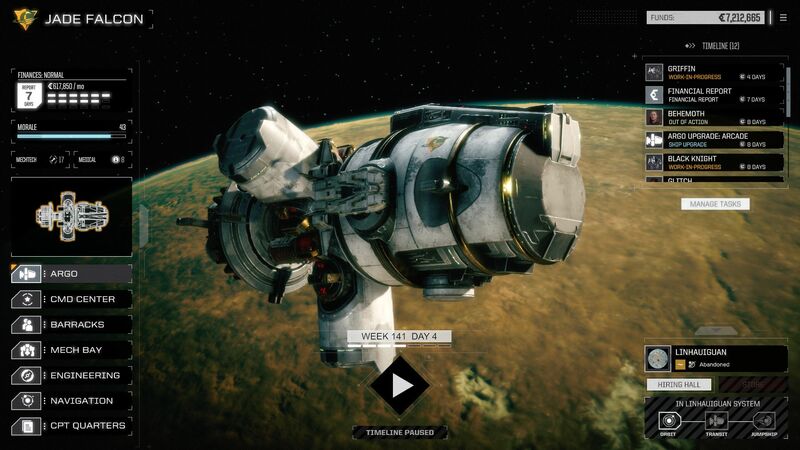 The further away the destination, the more JumpShip cut scenes you have to endure. While the passage of time is adequately represented, everything in the campaign takes too long. All the waiting is good practice for multiplayer. Online combat allows two people to battle it out in small arenas. Total ‘Mech budgets can be restricted so both players have roughly equivalent forces. Instead of using morale to target specific limbs, a fury gauge is used; this fills as damage is taken, so players getting pummelled get a tiny bit of help. Online combat has a time restriction per move (typically 60 seconds), but there was an additional 5-15 seconds of dead time on top of this as clients synced together—even when moving two units at once. Connecting to public games often required multiple attempts, so it’s not smooth sailing. If playing against others is too daunting or slow then skirmishes against AI will provide a healthy tactical challenge. BattleTech is a decent looking game that excels when it comes to the subtle details. The various 'Mechs designs are the highlight and it's always a treat to zoom in and see them lose a limb or smash a pesky tank into the ground. Their designs will be instantly recognizable for anyone who has played the series and most of the weapon effects, from lasers to self-guided missiles, are also a good reward. Biomes have good variety, from cratered moons to lush rolling hills. Some landscapes are washed out, but this is a side effect of the random weather conditions and time-of-day settings. After fifty contracts, across many systems, only a few scenarios repeated themselves. Harebrained Schemes have created enough planetary locales to ensure there will be minimal cases of déjà vu over the 60 hour-long campaign. While the interface becomes less of an issue in time, it's a bit messy and clunky. Outside of battle, there are delays when refitting 'Mechs or opening menus. In battle, default camera options provide cinematic views, but half the time it was from inside a rock. 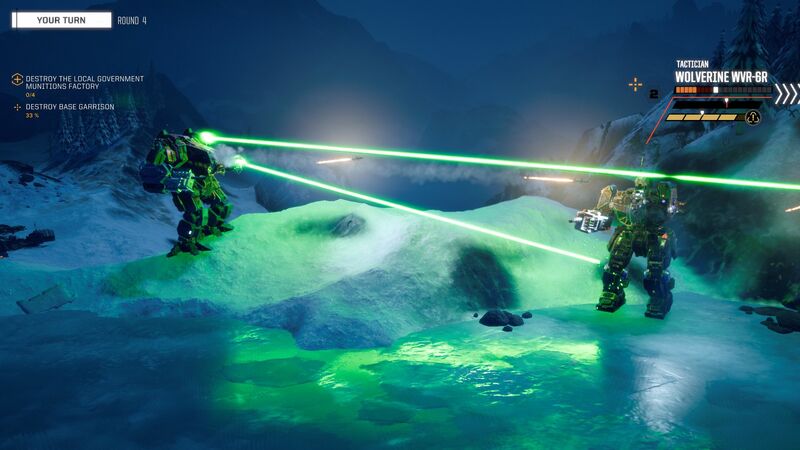 These automatic cameras can and should be disabled, but you'll still lose control every time the enemies take a turn, a building is destroyed, or a DropShip lands. On the technical side, the game has a few issues that match the clumsiness of the interface. Load times are long, both before and after missions. During the turn-based action, random pauses were common as units moved across the battlefield. And the framerate plummeted around destroyed buildings, making for some cumbersome attack vectors. 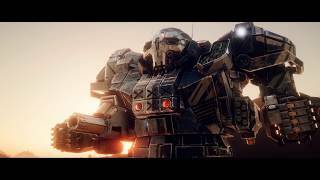 BattleTech may take dozens of hours to fully appreciate, but it is worth it. From a tactical perspective, it offers a great challenge and tremendous depth. Building an army of huge killing machines is rewarding, despite how long it takes. Managing everything, including repairs, pilots, and space travel, can alleviate some of the campaign grind. It’s a shame the story is spread so thinly. With a tighter interface and fewer technical issues, it could have been great. Still, this is a comprehensive tactical experience and BattleTech not only survives the war, it comes out the other side smarter and stronger. The BattleMechs look awesome. Environments are sometimes washed out but have good variety. Music is good. Tactically impressive turn-based encounters with nearly endless replay value. Using the environment and positioning carefully makes the battles challenging and interesting. The narrative isn't bad although it takes a while to get going. It is also spread too thinly across the 60 hour campaign and is inconsistently presented. Connection issues resulted in extra dead time on top of the relatively lax turn time. It is still possible to have decent skirmishes, once you connect. There was some stuttering when units move and camera issues between turns. Load times are long before and after missions. The tactical combat in BattleTech is excellent. Building a roster of gigantic killing machines and managing sundries offers a long-lasting gameplay loop. 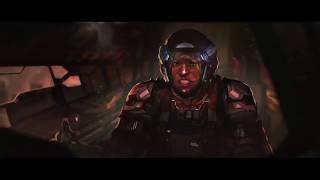 With a sharper narrative and more polish around the edges, the turn-based 'Mech-killing experience would have been unstoppable.